Although Spain is massively known for its ocean of Tempranillo, Garnacha and Monastrell based red wines; this beautiful country also offers a wide array of tasteful white wines. To name a few of my favorites, I highly recommend you to discover the delightful, crisp and slightly fizzy Txakoli from the Basque country made with the ever difficult to remember Hondarribi Zuria grape; the Sauvignon-like style of the Rueda made with Verdejo; the still undiscovered white Rioja made with Viura; and the light and refreshing Penedès and Ampurda-Costa Brava whites made from various grapes like: Garnacha Blanca, Macabeo, Moscatel, Xarel-lo, Chardonnay and even Gewürztraminer. If you really enjoy white wines, you will find some of the most refreshing and exquisite whites Spain has to offer all along the coast from Donastia-San Sebastian in the Basque country to Santiago de Compostella and Pontevedra on the western shores of Galicia, the greenest northwestern region of Spain. One of the most famous and now firmly established on the US ground is a light, crisp and racy wine made predominantly from the Albariño grape variety in the region of Rias Baixas. While the different sub-zones (within Rias Baixas) express subtle differences, the wines all share a number of characteristics. Boasting a pale golden lemon color, they are all crisp, elegant and fresh. Bone-dry and aromatic, these wines are packed with flavors of white peach, apricot, melon, pineapple, mango and honeysuckle. They have good natural acidity, mineral overtones, and are medium-bodied with moderate alcohol, usually about 12%. Rias Baixas have been selling fantastically over the last 10-15 years and in the meantime wineries burgeoned to favor the demand and increase the different styles. Although sold all year long, being so versatile, light and vivid, Rias Baixas Albariño slowly became a prime choice to complement summer aperitif, lunch and dinner. Further east, a few kilometers far from the Atlantic coast and Rias Baixas, is located a lesser known appellation called Ribeiro, also producing interesting whites but also some reds. White wine represents about 80% of the wine produced, and is most produced with the Treixadura variety, which is native to the area. Other authorized white varieties mostly used for Galician whites are: Albariño, Godello, Torrontés, Loureira, Macabeo and Albillo. Even further east, nestled between Ribeiro to the west, Ribeira Sacra to the north and Bierzo, its Castilla Y Leon counterpart to the east, the Valdeorras appellation resides as the bridge guardian between the two ancient kingdoms, at the easternmost boundaries of Galicia. Valdeorras, whose name means “Valley of Gold”, may have been the first grape growing and wine-producing region in Galicia. After the ancient Romans had finished mining the area for gold, they planted vines and the wines produced were mentioned in several inscriptions in Latin. Remember that we need to be eternally grateful to the Romans for spreading their knowledge and experience of viticulture everywhere they went. Already existing centuries before them and improved by the Egyptians and the Greeks, the domestic wine culture has we know it today as really started and rapidly expanded with them. Did you ever realize that the Roman's Empire extended only to countries where they could grow vines and make wines? No? Well check again, it seems that viticulture and wine were so much part of their everyday drinking and culinary culture and festivities, that it will have been useless for them to invade a country where they couldn’t produce the delectable juice. However, let’s go back to Galicia and Valdeorras. Like many wine regions in Europe, Valdeorras saw a decline of wine production during the Middle Ages where only monks and locals were really committed to viticulture and cultivation of the Godello grape, which, once strongly planted, was slowly denigrated and replaced by Palomino. Here again like most of European appellations, the region had to wait until the 19th century to experience a true renaissance. Yet the Phylloxera, which devastated most European vineyards between late 1860 and mid 1930, left the Valdeorras region on its knees and the Godello grape almost forgotten. It is only in the 20th century, after generations of trials and experiences, around the 70s, that the native Godello white grape variety was reinvigorated and became the focus and pride of the Valdeorras region. Consequently as a reward for its efforts to maintain high quality and consistency within a characteristic and defined environment, climate and delimited area, the region was elevated to the rank of appellation in 1977, becoming Valdeorras DO (Denominación de Origen or Denominación de Orixe in Galician). Nowadays, Valdeorras DO produces mainly red based with Garnacha Tintorera and the white Palomino grape. Yet for the past 10-15 years, Bierzo’s pride, the Mencìa red grape, and Godello, Valdeorras recurring white grape, have made a stronger impression and have gain ground in the US market due to the fruity and easy drinking red and complex, mineral and extremely food friendly white wines, that they respectively produce. It is in this up-and-coming region that Ladera Sagrada produces Castelo do Papa Godello. After Bodegas Godeval, which has always been one of my favorite Valdeorras winery, I’d like to share with you this newfound Godello based wine. Founded in 1920, Ladera Sagrada is a winery located in the mountain town of Larouco, about 90 kilometers east of Ourense in Galicia, nestled at 1749 feet of altitude (about 534 meters). The owner, Jose Sotos, possesses about 62 acres (25 hectares) of vineyards planted with Godello and Mencía grapes. Jose Sotos and Albino Fernandez, his vineyard manager and assistant winemaker make 2 wines: “Castelo do Papa Godello” and “Castelo do Papa Mencía” (Castelo do Papa means “Castle of the Pope”). Although, more inland than Rias Baixas and Ribeiro, Valdeorras benefits of an Atlantic climate, with average temperatures from April to October of 57.2 º F (among the lowest temperatures in Spain) and about 13 inches of rainfall which is quite low for this area. The high altitude and the cool temperatures provide a longer ripening period, which results in more aromatic, more mineral and fresher wines. Its low level of rainfall helps the grape by preventing night frost produced by rain-humidity. The mountainous soil is composed of slate stone, granite and thin clay layered in its topsoil and subsoil. This soil profile is poor in organic matter yielding 6 pounds (2.5 kg) of grapes per vine, compare to the average of 17 pounds (7.5 kg) per vine in Valdeorras. The granite and slate soil surface warms up during the day, releasing and thus providing heat to the roots at night when temperatures are cooler, which helps the grapes to keep ripening. Its lower yields result in more concentrated grapes providing more flavor intensity to the wines made by Jose Sotos. The success of the wines produced by Ladera Sagrada and crafted by Jose Sotos, is a combination of: the balance between the different soils and microclimate, allowing for fresh, intense Godello and Mencía wines; and the fact that it a family run winery which give more control over the quality of grapes and the resulting wines. It is also coming from the fact that Papa Godello doesn’t undergo malolactic fermentation achieving consequently greater aromatic expression and freshness. Yet the remaining key factor is surely one of the most important: 90% of the vines are 25+ year old, which confers great complexity and depth to the wines. The 2009 Castelo do Papa was crafted with 100% old vines Godello (25+ years) vinified in stainless steel tanks, with no malolactic fermentation. Approximately 1,800 cases were made, with roughly half sent to the US market. As a result of the hotness of the 2009 vintage, the 2009 Castelo do Papa Godello is fatter and rounder than I though it will be, with more fruit weight and soft edges rather than the usual fresh and racy Godello whites that I previously tasted, especially the 2006 and 2007 vintages. 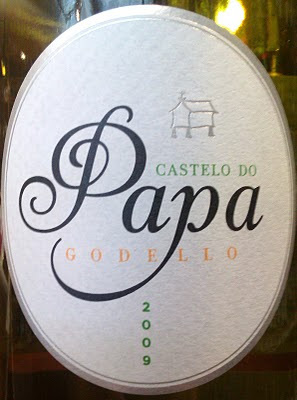 This 2009 Castelo do Papa Godello is really aromatic, almost tropical, with pineapple, mango and lime notes accentuated by firm minerals and herbal hints. The expanding palate is quite fat and full yet really clean and intriguing, showing great coating minerality, adding more dimension to the pineapple, yellow fruit juice and lemon zest flavors. Fairly bright and juicy with a good amount of oily glycerin, the long finish possesses enough acidity to balance the layers of pear, pineapple, citrus and light buttered rounded notes. It has tremendous complexity and generous mouth-feel for the price. The fatness is surely due to the 2009 vintage, but also to the old vines factor and may be the fact that this wine may have spent a bit of time on its lees before bottling. Overall, even without Malolactic fermentation, it feels really rounded and soft. I like this wine quite a bit, but I need to admit that previous vintage like 2007 corresponded more to my palate due to higher acidity and freshness with brighter fruit and purer minerality sensation. Yet it remains a great value and a go to food friendly wine. Pair it with fish in sauce or grilled. Its fatness allows it to complement more complex dishes with white meat and poultry cooked in a Mediterranean style with garlic, herbs and mixed vegetables.